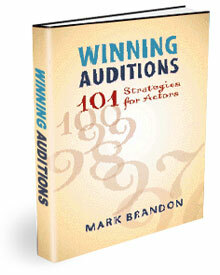 Articles from Mark Brandon's best selling book, "Winning Auditions"
Mark Brandon, a native Californian, who now makes his home in Vancouver, Canada, has worked as an actor, casting director, and producer. He presently writes for Canadian television and in addition to running workshops that assist actors in making the transition from stage to film, Brandon has written the best selling book, Winning Auditions - 101 Strategies for Actors. His book, Winning Auditions - 101 Strategies for Actors, isn't about methods. It's not another how-to book. Winning Auditions is a revelation: a shared collection of actors' trade secrets -- tricks of the trade divulged by professionals in an experimental workshop that lasted nearly a year. In his book, you will discover what actually sells you more than talent. You will find out how powerful body language can be, and even how influential color is in the audition room. You will learn what keeps a photo on a casting director's desk and what keeps a casting director on your side. In short, you will have 101 innovative ways to get what you have always wanted: more of the parts you deserve. "Reading Winning Auditions is like striking gold. There's scarcely an actor alive who won't come away from it without becoming greatly enriched." "It's a bible, it's a friend, it's a life preserver. However you look at it, Mark Brandon's Winning Auditions is undoubtedly the hands-on, inside track to success." "Any actor who reads Mark Brandon's wonderful Winning Auditions will have a huge head start on the competition. Brandon's insights are born of common sense and years of experience. I wish I'd had it when I was starting out." "Winning Auditions is a fun, easy read and so incredibly full of worthwhile advice, it should be required reading for every acting school in the country. Indeed, it may one day well be."